What’s next for Katie Nolan at Fox Sports? 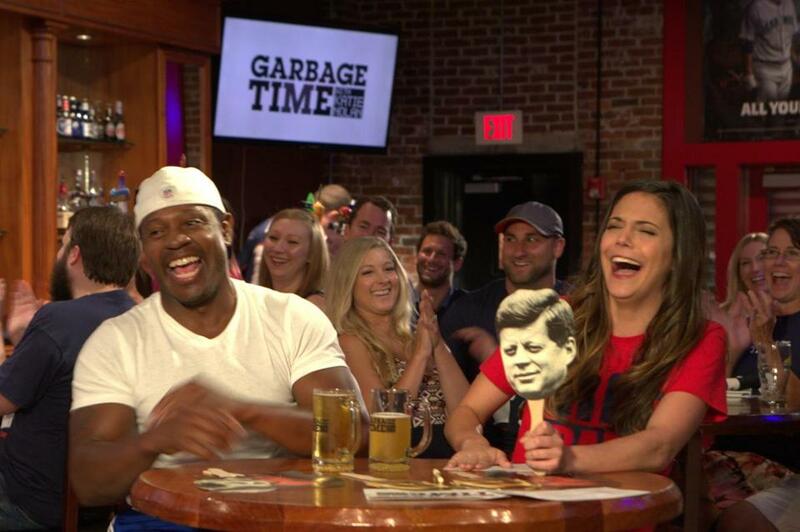 Katie Nolan (right) hosted Garbage Time on FOX Sports 1 at the White Horse Tavern in Allston in Sept. 2015. I’ve always had the sense that Fox Sports knows it has a special television personality in Katie Nolan. If the network didn’t have that figured out before the Framingham native won an Emmy in 2016 for her program “Garbage Time,” that little gold trophy should have been the final clue. But while Fox Sports figured out that Nolan is a host of quick humor and uncommon on-camera charisma, it seems its executives have never quite solved how to use her best. “Garbage Time” airs weekly and late at night on Fox Sports 1, and is sometimes bumped off its start time by late-running sporting events; it’s not exactly prime time. She deserves better, and perhaps now she will get it. Fox Sports has decided that “Garbage Time” will not return in its current humor-centric format on Fox Sports 1 once its current hiatus ends. The show’s contract expired after the Super Bowl. Fox Sports hasn’t officially announced the end of the program, and it’s possible that “Garbage Time” — which had a loyal if hardly massive audience and was well-received critically — comes back with the same name but in a different format. Sports shows have long relied on guffawing guys, but the Framingham native has something fresh going on. That would be a mistake, since the title is associated with the freewheeling version of the program, which offered an endearing mix of comedy and camaraderie. It’s hard to see how it would gain an audience in a new format under the same name, unless it’s aired in a much more appealing time slot. But it’s easy to see how it would alienate its old audience. It’s certainly an interesting time at Fox Sports 1. On Thursday, the network canceled “Fox Sports Live,” which has been revamped a few times since it became the network’s flagship highlights program upon its launch in August 2013. Hosts Jay Onrait and Dan O’Toole, hired with much fanfare from TSN in Canada more than three years ago, have been informed their contracts will not be renewed. The show has been pulled from the air effective immediately. That would seem to be another step in Fox Sports 1’s quest to be your television home for headache-inducing hot takes 24/7. But perhaps “Garbage Time” can be salvaged in all of this. Perhaps Nolan is in line to become a significant part of the plan to replace “Fox Sports Live,” as one source indicated. At the least, the network knows it has something in Nolan, even if it doesn’t recognize this: She’s better than what the network seems interested in becoming. Wednesday was the 37th anniversary of the “Miracle on Ice.” The US Olympic hockey team’s transcendent 4-3 victory over the mighty Soviet Union squad in the 1980 Olympics was of course accompanied by a call worthy of the moment. But it’s funny to look back on Al Michaels’s perfect-in-every-way “Do you believe in miracles? YES!” and realize how close color analyst Ken Dryden was to stepping all over it on a couple of occasions. Michaels calls the tense final minute of the game without a word from Dryden — until there are three seconds left and Dryden exclaims “It’s over!” right before Michaels asks us if we believe in miracles. Then, after the call, Dryden blurts, “Unbelievable!” before the microphones go silent for more than 50 seconds as the cameras show us the jubilant scene. It’s the greatest sports call of all time, despite the analyst’s intrusive timing. It’s pretty funny to look back on now. WEEI’s addition of Rich Keefe to its afternoon drive-time show with Michael Holley and Dale Arnold has worked extremely well since he came over from 98.5 The Sports Hub in December. The chemistry, particularly between Holley and Keefe, has been especially noticeable during Celtics discussions over the last two weeks as the NBA trading deadline neared. There isn’t more informed and entertaining NBA talk on another program in the market, especially with their competition, where it’s too often hard to tell where the trolling ends and the lack of knowledge begins. The news wasn’t shocking, but it was still disappointing to see WEEI formally part ways with Chris Price and Mike Petraglia last week. Price is one of the finest and most prolific football writers in Boston, one with deep institutional knowledge and welcome, reasonable perspective on the Patriots. And it seems like Petraglia, a jack-of-all-trades who was good at all of them, never missed a big event in Boston sports no matter which team was playing and where. It’s a tough industry right now, but Price and Petraglia would be assets to any company wise enough to hire them . . . Sounds like Comcast SportsNet New England’s pivot to a more debate-centric format is set to occur in early April, though exactly what that means in terms of specific programming is still being sorted out. Expect Tom Curran — CSN’s Patriots insider and the host of the excellent “Quick Slants” program — to play an even larger on-air role.